Starring: François Cluzet, Omar Sy, Anne Le Ny, Audrey Fleurot, Clotilde Mollet, Alba Gaïa Bellugi, Cyril Mendy and Christian Americ. He only wants a signature to keep social welfare off his back. Senegalese émigré Driss (Omar Sy) has no intention of getting hired when he applies to be a live-in carer for millionaire paraplegic Philippe (François Cluzet). Following a disastrous interview – during which Driss flirts with the Parisian aristocrat’s foxy secretary and robs a Fabergé egg – no one is more surprised than he when the older man takes him on for a trial. Slowly but surely, the two become friends. Driss introduces Philippe to marijuana, massage and Earth, Wind and Fire; Philippe, in turn, introduces art, classical music and paragliding. By now you’ve likely heard of Untouchable, the biggest French success of 2011 and the biggest grossing non-English-language title of all time. Last year the culture clash comedy was voted the arts event of 2011 in France. It won by a landslide margin and will represent France at next year’s Oscars. Anglophone territories have waited as Intouchables, to use its birth name, smashed records around the world, snaffling up $364.6 million and topping charts in Germany, Poland, Switzerland, Spain, Austria, Belgium and Italy. 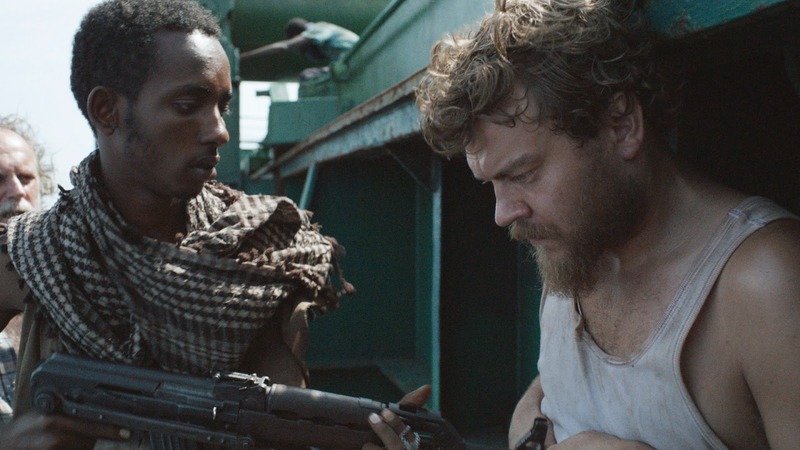 A tense and intricately shot drama, writer/director Tobias Lindholm’s solo debut is a powerful and intensely watchable film as it tackles the high-pressure negotiations over a hijacked ship. Lindholm wrote for the award-winning Danish TV series Borgen, as well as scripting Thomas Vinterberg’s The Hunt, while with Michael Noer he co-directed the tough prison drama R.
The film opens with simple sequences of the ship’s cook Mikkel (Pilou Asbæk) going about his work, but never actually shows the hijacking of the Rozen, a cargo ship in the Indian Ocean, instead skipping two days forward to see CEO Peter (Søren Malling) first discover his company’s vessel has been hijacked. Over the coming weeks Peter has to haggle with translator Omar (Abdihakin Asgar), while on board the Rozen, Mikkel and his fellow shipmates are locked below decks and start to lose hope that they will ever escape alive. An atmospheric thriller and coming-of-age tale set on a slow bend in the Mississippi river, Mud has the look and feel of an American indie classic. It is a surefire best picture nominee at next year's Oscars and likely to win some kind of award at Cannes, receiving the warmest applause of the festival at its morning press screening. Mud takes its name from its lead character, played by Matthew McConaughey, delivering the best performance of his career (and his second at the festival, after The Paperboy) as a fugitive holed up on an island in the Mississippi after murdering a rival for his lover Juniper (Reese Witherspoon). Mud is wanted by the police and bounty hunters hired by the murdered man's family. He is discovered, however, by two 14-year-old boys, Ellis and Neckbone, who live in houseboats along one of the river's swampy tributaries. They fall under Mud's charismatic spell and are talked into helping him rebuild an old motor boat stranded in a treetop – dumped there, one assumes, years before by a flood or a tornado. The boys are beautifully played by Tye Sheridan (who starred as one of Brad Pitt's sons in last year's Palme d'Or winner, The Tree of Life) and Jacob Lofland. The teenagers' thrill and adventure in secretly aiding Mud gives the film a Huckleberry Finn-ish flavour that blends with something akin to Rob Reiner's 1986 classic Stand By Me and Charles Laughton's The Night of the Hunter. For such an American film, there are also clear echoes of British classics such as Great Expectations and Whistle Down the Wind. As the net tightens around Mud, Ellis also becomes a go-between, ferrying messages to Juniper as she takes shelter in a motel. Meanwhile, Ellis is also developing a crush on an older girl from his high school, heading for some harsh lessons about the nature of romance. The long-awaited follow-up to her exquisite Somersault, Australian director Cate Shortland’s adaptation of the novel The Dark Room by Rachel Seiffert is a sensual and complex story that explores the tribulations faced by the young in the aftermath of World War II. Pierce Brosnan stars in the innocuously-titled but gloriously enjoyable Love is All You Need, the latest film from the Danish director Susanne Bier, whose In A Better World won the foreign language Oscar in 2011. Brosnan plays Philip, a widower and big noise on the Copenhagen fruit and vegetable wholesale scene who is hosting his son’s wedding at his villa in Sorrento. Also in attendance is the mother of the bride, Ida (Trine Dyrholm – A Royal Affair), a cancer survivor who has just completed a course of chemotherapy but is still awaiting the final all-clear. Ida’s tubby husband has absconded with the girl from accounts, so she, like Philip, is without a date. As they make the final preparations for their offspring’s nuptials, the flames of love start to catch. One of the year's best films has arrived quietly, unnoticed by the awards-season cheerleaders, but with its delicacy and complexity, it puts the Oscar-bait to shame. Hirokazu Koreeda's I Wish has taken two years to come to Europe. It has been more than worth the wait. Like his earlier movie Still Walking, this is a deeply considered Japanese family drama in the tradition of Ozu, with echoes of Edward Yang and Tsai Ming-liang – moving, sometimes heartbreakingly sad, often mysterious. The film is about the powerful imperative of family unity, but also about the inevitability, and even desirability, of families finally disintegrating and allowing everyone involved a painful kind of freedom. The original title is Kiseki, or "Miracle", and a miracle is being longed for by two brothers, around nine or 10 years old: they are Koichi and Ryu, played by real-life brothers Koki and Ohshirô Maeda, from whom the director gets terrifically natural and relaxed performances. Their mum and dad have broken up; Nozomi (Nene Ohtsuka) has returned to live with her parents and taken a demeaning supermarket job in her hometown of Kagoshima, within sight of the Sakura-jima volcano, which, with eerie calm, like a figure in a painting, is in a state of silent eruption on the distant skyline. It deposits a fine film of ash over everything, which the city-dwellers must continually clean away. Koreeda does not belabour the metaphorical quality of this volcano, or the Pompei-snapshot of ordinariness he himself records. Meanwhile the father, Kenji, (Jô Odagiri) stays in Osaka, where he pursues the laid-back slacker lifestyle that so infuriated Nozomi, failing to hold down day jobs while in the evenings trying to be a guitarist in a band. The difficult and upsetting thing about this arrangement – never fully discussed by anyone, adult or child – is that the warring parents have taken a child each: withdrawn, thoughtful Koichi has gone to his mother and grandparents; easygoing and smiley Ryu has gone to live with his dad. Clearly, this setup is a way the couple have found of signalling to others and to each other that the breakup is temporary; they are taking a break and sharing the childcare burden equally, though without fully considering how the children will feel about it. But as the days and months go by, Koichi can feel the situation hardening into permanence and, talking with his brother on his mobile, hatches a strange and poignant new plan: he has heard that the two newly built bullet train lines create a supernatural energy at the point where the trains whoosh past each other. If the boys can just contrive to skive off school and make a wish at this focal point, their happiness can be restored. Much of the richness and fascination consists in showing how everyone's lives are just rolling along – and in showing how there are other lives and other stories developing in parallel to the main event and beginning to mean just as much. One of Koichi's friends has developed a crush on his teacher and steals her bicycle bell; Koichi's grandfather, who is trying to market his own brand of sweets, finds a new ally in Koichi himself, who is willing to taste them and share his opinions. One of Ryu's friends is a child actor getting work on ads and TV shows, and we see her mother, a failed actress, becoming restive and resentful. These narratives are branching out unobtrusively, but with quiet purpose and definition.